Tetrathiomolybdate (TM) reduces anchorage-independent growth of BCPAP cells. A, % transformed growth in soft agar (mean ± SEM, triplicate samples, three experiments) normalized to vehicle control of BCPAP cells treated with increasing doses (effective concentration) of lenvatinib (blue ▲), sorafenib (■),TM (●), vemurafenib (◆), or trametinib (△). Clin Cancer Res, 2018, 24(17):4271-4281. Lenvatinib (E7080) purchased from Selleck. Chin J Cancer Res 2013 25(5), 572-84. Lenvatinib (E7080) purchased from Selleck. Calculation of IC50 of E7080 (IC50 =5.60×10–8 mol/L, square R =0.998). Inhibitors of tyrosine kinase receptor suppressed the in vitro angiogenesis of HUVECs. The angiogenesis of HUVECs was evaluated in the absence (control in A) or presence of CP-673451 (5 nM), a selective inhibitor of PDGFR or E7080 (50 nM), an active inhibitor for multiple tyrosine kinase receptors for 6 h. The two agents only inhibit the kinase activity of the relative tyrosine kinase receptors, but do not cause a toxic effect to the cells in the concentration used in this study (Roberts et al., 2005 ; Wiegering et al., 2014). For quantification, the values for the pattern recognition, branch point and total capillary tube length are described in the Methods section. Representative microscopic fields are shown in Panel A. The suppressive effects of the inhibitors on angiogenesis of HUVECs are shown in B, C and D. The data are expressed relative to that of the control cells without exposure to the inhibitor. N = 5, *P < 0.05 and **P < 0.01 versus the control cells. Environ Toxicol Pharmacol, 2016, 46:168-73. Lenvatinib (E7080) purchased from Selleck. Dot Plot Distribution of Live, Preapoptotic and Apoptotic Cells after Administration of DuP-697 and E7080 Combination. Asian Pac J Cancer Prev 2014 15(7), 3113-21. Lenvatinib (E7080) purchased from Selleck. Matsui J, et al. Int J Cancer. 2008, 122(3), 664-671. Matsui J, et al. Clin Cancer Res. 2008, 14(17),5459-5465. Glen H, et al. BMC Cancer. 2011, 11, 309. Vandetanib (ZD6474) : VEGFR2-selective, IC50=40 nM. Cabozantinib (XL184, BMS-907351) : VEGFR2, IC50=0.035 nM. Axitinib : Approved by FDA for Renal Cell Carcinoma. 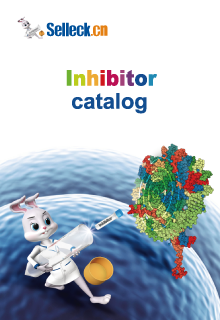 Nintedanib (BIBF 1120) : Potent triple angiokinase inhibitor for VEGFR1/2/3, FGFR1/2/3 and PDGFRα/β with IC50 of 34 nM/13 nM/13 nM, 69 nM/37 nM/108 nM and 59 nM/65 nM. Phase 3.